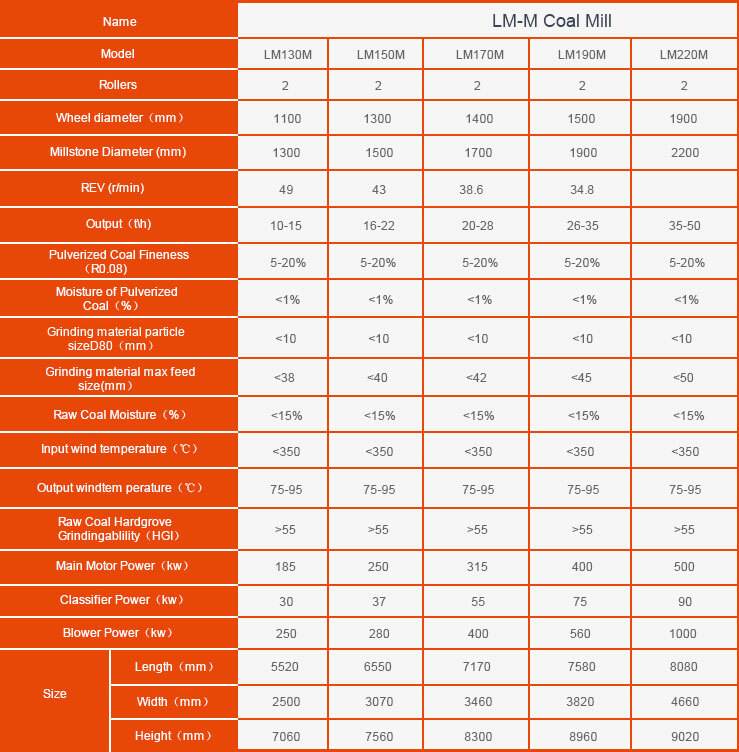 LM series vertical roller mill is one advanced powder making mill which is developed through many years’ research &experience and bringing in the latest mechanical techniques of Europe. 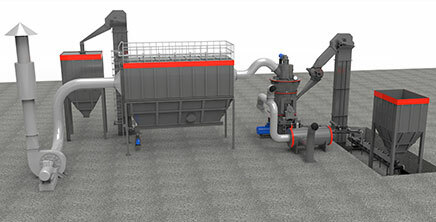 It is one complete plant that integrated with drying, milling, classifier and elevator. 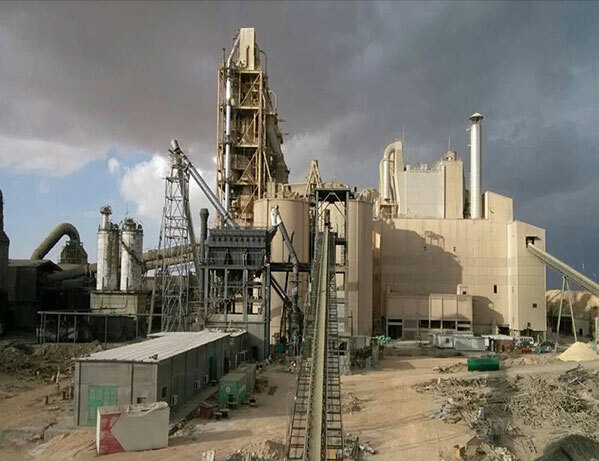 It is the high standard mill with many advantages, like taking a little space, high efficiency and energy-saving, and the LM Vertical Roller Mill fully meets the requirement of clients in the high production of powder. 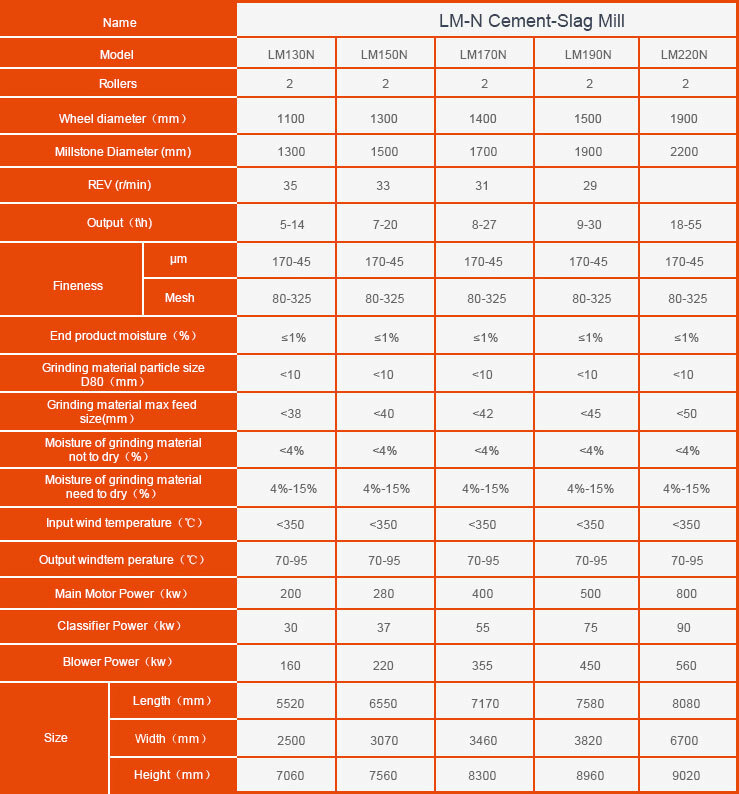 According to LM mill’s different applications, it contains three series. 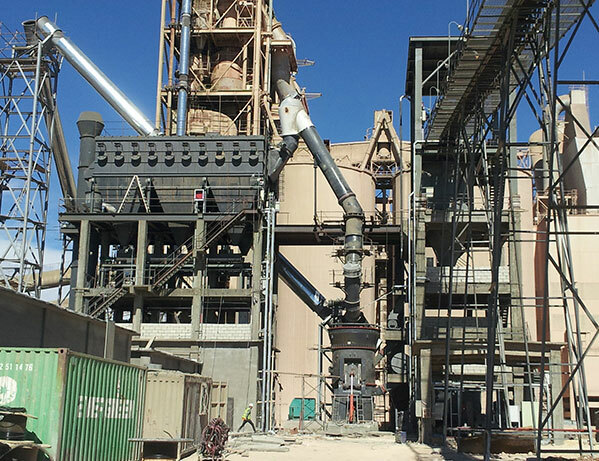 LM-K mineral mill is suit for producing raw cement; LM-M coal mill fit for grinding coal powders and LM-N cement-slag mill is mainly used to pulverize hard materials, such as slag, cement clinker and many other chemical materials. Because the rollers do not rub the grinding plate directly and both of them adopt the finest material, the service life is extended and the abrasion is reduced. 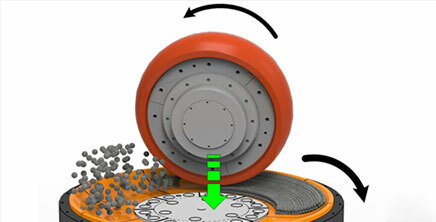 Rollers grind the material on the grinding plate directly, reducing 30% ~ 40% energy consumption compared to ball mill. 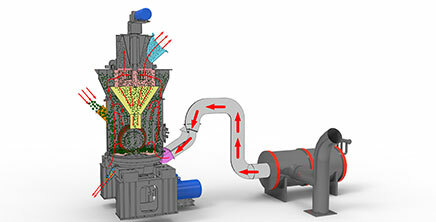 The inner hot wind can dry all the powders directly; this function not only helps investors save the investment cost of dryers and reduce the energy consumption. Different requirements of different moistures are easy to solved by adjusting the temperature of the hot wind. By controlling the hydraulic device and turning the lift arm, it is easy to replace the roller sleeves, grinding plates. In this way, both maintenance time and labor cost are saved. Limiting stoppers are equipped in this machine, they can protect the roller from impacting millstone device directly, averting devastating-impact and reducing the failure rate. LM Vertical Roller Mill is equipped with Expert Control System, operators can switch remote-control and local-control freely. 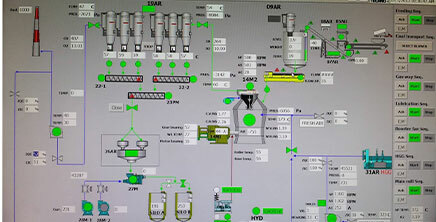 And it is easy to operate, good for saving labor cost. Due to the short residence time, materials are prevented from being re-ground, the particle sizes are easy to control and the chemical compositions are well kept. 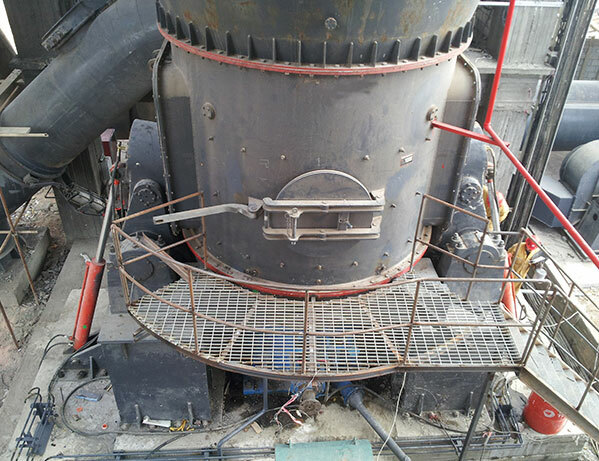 For the roller don’t contact with the millstone device directly, there is few Fe attrition，it efficiently reduces the pollution when this machine is used to grind white or hyaline materials. 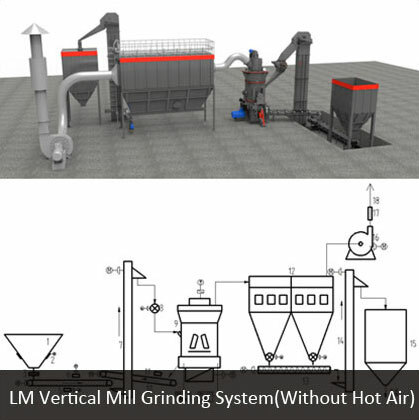 LM vertical roller mill adopt combined-type high efficiency classifiers. 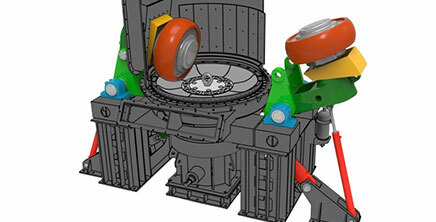 The rotor REV is adjustable, so it is able to meet different requirements. 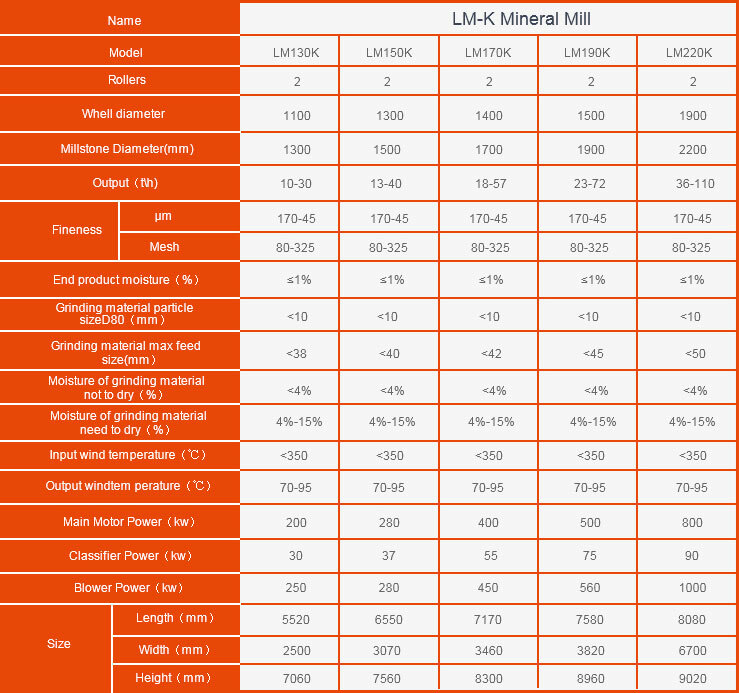 LM vertical roller mill perform steady and has little vibration, so it is of little noise. Benefit from its negative-pressure working environment, it is of little dust, achieving Environmental Protection Request well. 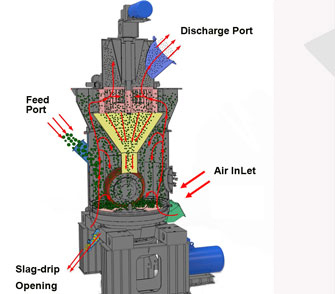 Motor drives millstone-device through reducer and the hot air comes into the machine from the air inlet. When the materials are fed to the centre grinding plate, they move to the edge of grinding plate under the action of centrifugal force. 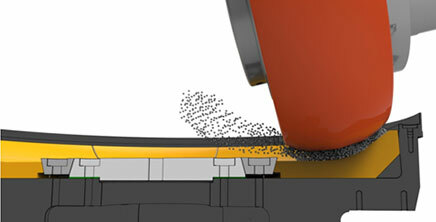 Then the material are grinded by the grinding rollers when they pass through the grinding zone. Crushed materials continue to move to the edge of the grinding plate until taken away by the airstream. The big ones fall down and the process of grinding continues. The qualified ones pass through the separator and are gathered by the collector. If there are some irons or some other sundries, they will fall down from the grinding chamber under the action of gravity when they move to the edge of millstone device. Finally, the scraper will clear them from the grinding machine. 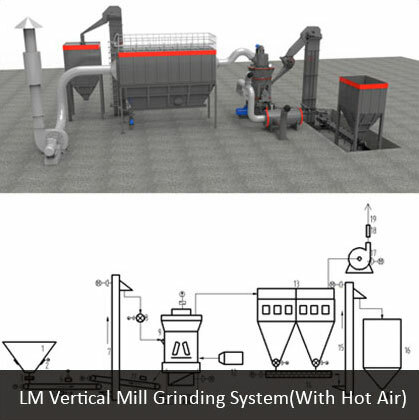 LM vertical grinding system is made of raw material feeding system, grinding system, drying system and final-products transportation system, etc. 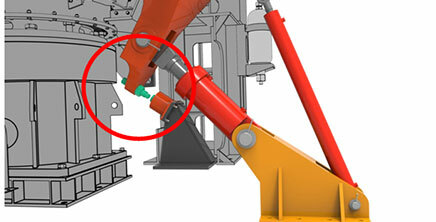 For special materials, the auxiliary system is optional, such as explosion protection system. The drying system include two types, the pulse dust filter open circle system (without hot air) and pulse dust filter open circle system (with hot air). 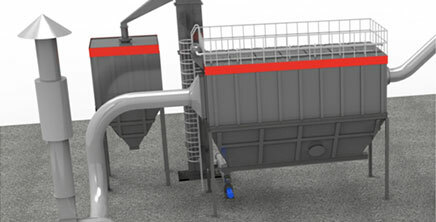 Raw materials in the hopper are lifted by elevator and pass though air-lock device, enter into the grinding chamber. Ground by the LM grinding mill, powders are collected and transported to silo. The advantages of this system are that it has simple structure, low investment and operation cost. For there is no heat source, it is suit for grinding dry material, the moisture should below 4%. One hot-blast stove is installed in this system, powders can be dried during the grinding process, helping clients save one dryer. And the off-gas are recyclable, the fuel cost is cut down obviously. 2.Supposing that the raw material moisture is bigger than the require-ments, or operators have special requirements, operators can use hot wind. 3.The parameter is for reference. Detailed configuration depend on the practice. Brief Introduction: From the enquiry of customer, ZENITH make the full proposal of engineering design, equipment list, construction work and installation and commissioning etc with rich EPCM foreign projects. Based on Lafarge group standard, ZENITH improve the details of complete project and the operation data exceed the expectation of each sides. More info please contact [email protected]. 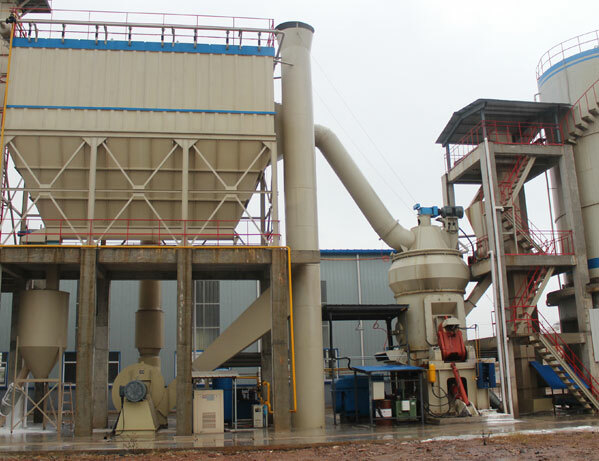 Brief Introduction: This complete grinding plant is designed by ZENITH and customer required high cost efficiency, the lowest investment is very important for them. Through ZENITH overall consideration, Zenith optimize the design, make the simple processing flowchart, occupy small land and reduce civil works and accessories. 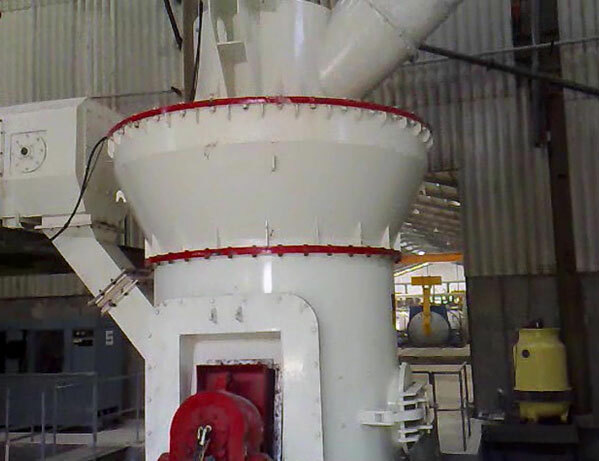 Finally this Vertical Roller Mill grinding plant meets the requirements and achieve very good profits in local industry. More info please contact [email protected].